Woohoo! Oh my goodness. I stumbled upon something incredibly fun and wonderful tonight. I cozied up to spend the evening reading on my couch. I decided to pull my laptop over and check twitter quickly before diving back into Passenger. Well…that was over an hour ago. I stumbled upon #boutofbooks on Twitter and knew my evening plans had changed. 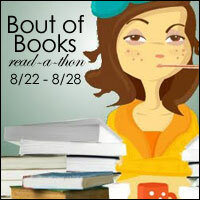 I’ve decided to participate in Bout of Books 17. I’ve already a bunch of new friends. Everyone on the twitter chat was friendly and kind. It’s never a bad thing to make new friends. Here’s to a fun week!